So begins vegan mo(nth of)fo(od), a month-long vegan blogging extravaganza throughout the interweb. There are over 200 people participating, flooding the internet with vegan recipes, ramblings, pictures and more. I am participating this year and the goal is to blog at least 5 times a week. There is a photopool over at Flickr as well. I’ll start the month off with something simple. Breakfast! 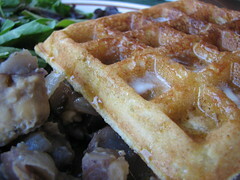 The waffle recipe is the Lemon Corn Waffles from Vegan with a Vengeance. These waffles are easy to make and come out amazing. The soy yogurt makes them light and airy and perfect. I’ve substituted the yogurt for blended tofu and it’s also good, but I prefer it with the yogurt. I also used lime juice instead of lemon juice and didn’t notice any major changes in flavor. Since I seem to encourage fruit to mold, I have a nice trick for maintaining a supply of fresh lemon and lime juice. When I buy the fruit, I zest it using a microplane and put that in a ziplock bag in the freezer. Then I juice whatever I have and measure out a tablespoon of juice into each compartment in my ice cube tray. Once the cubes are frozen, I put them in a jar and keep them in my freezer until I need them. I find that whenever I do a last minute dinner and it calls for lemon juice, I never have a fresh lemon on hand. Not anymore! My freezer is stocked and ready for future batches of waffles or whatever. I ate the waffle with my homemade ginger syrup (cut with some maple syrup and Earth Balance because it’s spicy stuff) and the blue flannel hash from V’Con. I had to cook the potatoes a bit longer than called for in the recipe because I didn’t cut them small enough. It’s a hearty, satisfying dish, but I realized I never liked hash growing up, so it’s not a favorite. I think it’s a textural thing; I prefer my potatoes crispy. I’m with you – I love crispy potatoes. This breakfast looks incredible. I hope you enjoyed every bite of it! Your idea for preserving lemon/lime zest and juice is brilliant-thank you!